As calls to cut the U.S. food stamp program are growing shriller, know that their explosive growth and wide distribution during the recession was built in as a feature, not a defect. Unlike most federal “safety net” programs, the barriers to getting food stamps have intentionally been set low. For unemployment insurance, you had to have had a job. For the Earned Income Tax Credit, you need to have a job. Welfare? 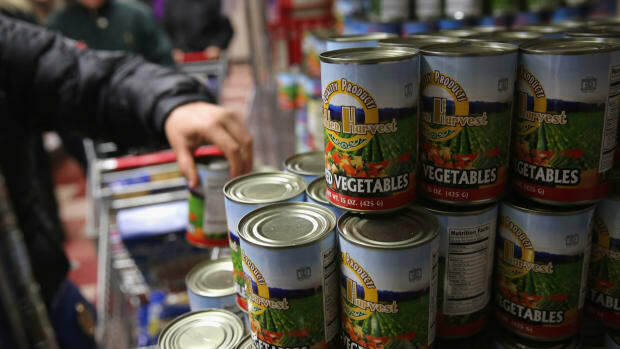 Temporary Aid for Needy Families, as it’s officially called, is limited to people with dependent children and has a lifetime cap (three, four, or five years) that varies by state. Medicare, Medicaid, Social Security, workers comp—all have eligibility rules. But food stamps? “In contrast with many other programs serving low-income households, [Supplemental Nutrition Assistance Program] eligibility does not depend on family structure, age, or disability status, so benefits reach a broad range of disadvantaged households,” explains the U.S. Department of Agriculture, which administers the program. Although specific rules vary by state—here’s a nice color-coded guide—if your paycheck puts you at 130 percent of the poverty line or less, you already get public assistance, and don’t have more than $2,000 in savings, you’re in. Merely 60 or older? You’re in. A legal immigrant? After five years in the U.S., you’re eligible, or if you have kids under 18 and you’re poor. Illegal immigrant? Don’t get crazy—you’re not eligible. Last week, in a pretty much party-line vote, the U.S. House of Representatives voted to scale back SNAP spending by $39 billion over the next decade by returning to earlier, more restrictive eligibility criteria, especially for adults without kids. (SNAP’s budget in FY2013 was $83 billion.) Texas Congressman Mike Conaway said the cuts "limit the public assistance program to those who qualify and close loopholes that have allowed people to game the system." The Congressional Budget Office estimates the measure would push three million people off the program and reduce benefits for another 850,000. There are currently about 48 million people receiving SNAP benefits, although expectations are that number will inevitably decline as the economy perks up. Conaway is wrong in a sense–these requirements aren’t loopholes, they were put there by design in 2000. As to people scheming, that’s going to happen regardless in a program this size. What’s surprising—if you take the government’s word for it—is how little gaming actually occurs. The USDA’s inspector general last month reported no “high-dollar overpayments” in the SNAP program. Realistically, though, conniving for food stamps would be a penny-ante scam, say selling your loaded EBT card for cash, that wouldn’t show up as “high-dollar” crime. Nonetheless, the USDA says these crimes have actually fallen in the last 20 years, costing the program one cent for every dollar expended compared to four cents in 1993. 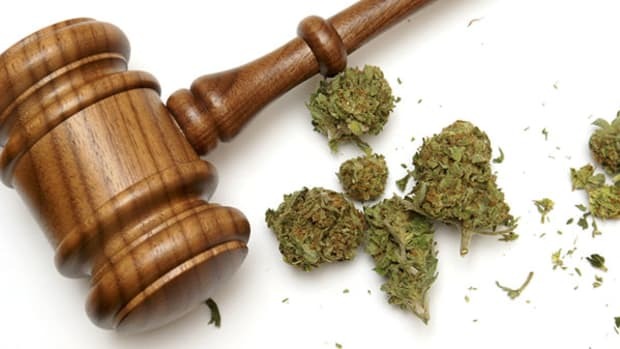 “In FY 2012,” the feds reported, “OIG SNAP investigations resulted in 342 convictions, including a number of multi-year prison terms for the most serious offenses, and approximately $57.7 million in monetary results.” My favorite scam is buying something that has a deposit on the bottle, pouring out the liquid, and collecting the deposit. Again, penny-ante. But what are numbers when you’ve got anecdotes—the able-bodied college student who found out it’s really easy to qualify for the program, the apparently not-broke woman living in a nice neighborhood who cheated the system, or the surfer dude eating lobster. A paper in the new special edition of The ANNALS of the American Academy of Political and Social Science takes a more dispassionate look at SNAP and the rest of the federal safety net to see how well it functioned during the Great Recession. Johns Hopkins economist Robert A. Moffitt argues that while it cost a lot, the net worked as it was supposed to—“in significant and favorable ways,” as the academic prose goes. Aggregate spending in the main safety net programs rose from $1.6 trillion to $2.1 trillion from 2007 to 2010. Caseloads over all programs rose over the same period—from 276 million recipients to 310 million. The largest contributors to this increase were the [unemployment insurance] program, the earned Income Tax Credit (EITC), and the Supplemental Nutrition Assistance Program (SNAP), which, combined, accounted for about a third of the rise in spending. Let’s take a look specifically at Moffitt’s findings about SNAP. The first eye-opener is how puny the average payment is—$96 per person at the start of the study period, compared to say, $646 a month for federal housing aid or $632 for Head Start, both means-tested programs. Of course, when you spread even a puny amount over a lot of people, you can see how SNAP’s pre-crash budget was $30 billion and its 2010 budget was then $65 billion. Most of that increase was from new recipients, Moffitt reports, and not from the more generous (but frankly, still penurious) benefits OK’d by the stimulus act. As for demographic groups served, the Medicaid, TANF, housing, and EITC programs primarily benefit families with children and not childless individuals or families, and Medicaid and TANF primarily benefit single-mother families. 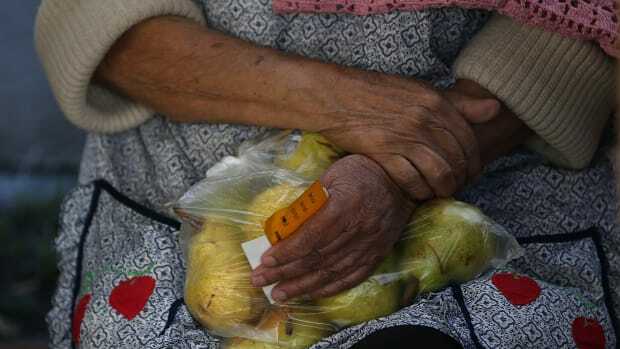 The SSI program provides benefits to only the elderly and disabled. SNAP is the only program with near-universal demographic eligibility. Aside from SNAP, therefore, one should not expect all demographic groups to benefit equally from an expansion of the safety net. Surprisingly, it wasn’t those damned long-term poor people that the current breed of SNAP reformers yammer on about who received the most benefit from the suite of government aid. Often, Moffitt reveals, it was the people in “shallow poverty,” presumably the so-called working poor and the folks it’s cool to help out, who saw as much assistance as those in deep poverty. While SNAP and unemployment did help those hurting the worst, the overall safety net, he writes, isn’t particularly progressive. Moffitt didn’t study the safety net’s effect on whether being on the dole discouraged people from wanting to return to work. Over the years, I’ve known people who are willing to slink by on stingy benefits rather than punch a clock, and based on my very own anecdotes the idea that someone might be seduced by this culture of dependency isn’t entirely foreign. But Moffitt searched the academic literature, and while no studies looked (yet) at the Great Recession, research done during normal times finds “for the two most important programs in the recession, SNAP and the EITC, the literature shows that they have very small effects on work effort.” Small, but not non-existent: A 2010 paper from the National Bureau of Economic Research did find some work disincentives, especially among single moms, during the researchers’ 1963-1975 study period, a finding the authors wrote remained relevant today. But they also noted that the impact of food stamps on employment choice was definitely less than that of the more lucrative welfare, and remember that welfare these days has a lifetime cap. The future of SNAP primarily depends on whether the eligibility requirements that were relaxed during the recession and the SNAP reforms of the 2000s are maintained. The withdrawal of [unemployment insurance] benefits will primarily affect those at the bottom of the income distribution, according to the figures here, and any contraction in SNAP benefits will as well. The maintenance of the EITC more or less in its permanent structure will continue to benefit those with somewhat higher incomes. The progressivity of the safety net is, therefore, likely to decrease after the recovery. Rather than chipping away at the edges of progressivity with debate on SNAP or flat taxes on the right, or trying to hold the line with hand-wringing about income inequality on the left, perhaps it would be more fruitful, if less likely, for a knock-down, drag-out on whether we still want a “progressive” (in the economics sense) country at all. Do Food Stamps Really Discourage Work? 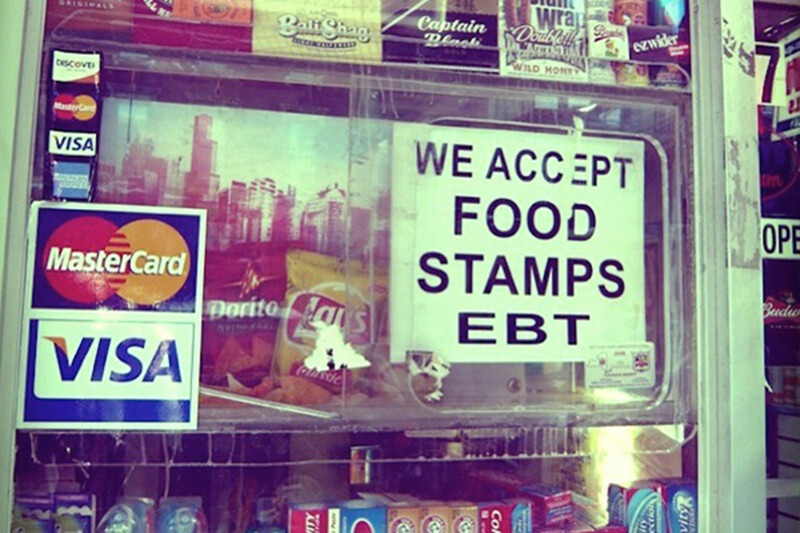 Hundreds of thousands of the poorest Americans will lose their food stamps this year. What will become of them? 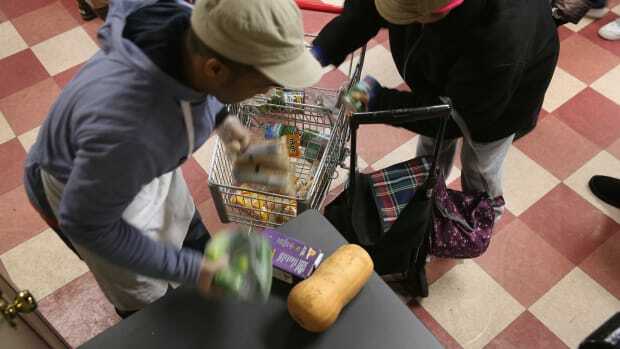 An anti-SNAP campaign in Washington, D.C., and proposed legislation to reduce the social safety net are both feeding off well-worn myths around welfare recipients. 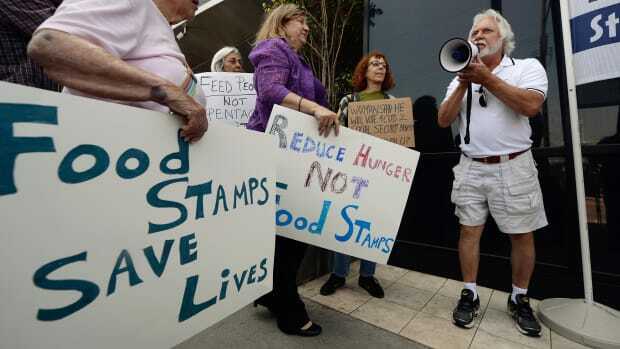 Should a Drug Conviction Mean a Lifetime Ban on Food Stamps? A new report from The Sentencing Project assesses the damage of a Clinton-era policy. These three charts show that new proposed work requirements are a solution in search of a problem. A program in a poor San Diego neighborhood shows how the fresh foods available at farmers markets can be accessed by those on food stamps. A new report confirms that, while SNAP recipients do indeed work, they may still be hurt by work requirements.